Justin Kauflin and Clark Terry at the piano in "Keep on Keepin' On. "Photo from "Keep on Keepin' On." “KEEP on Keepin' On” is both a labor of love and testament to the fact that if you believe you can achieve. 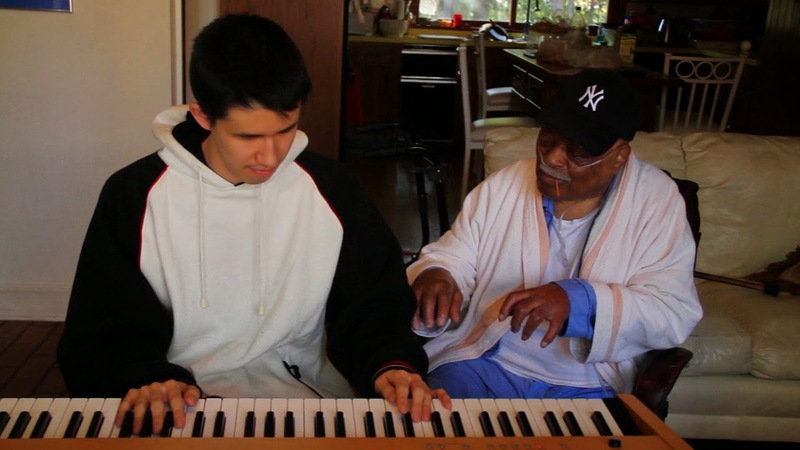 The documentary from Alan Hicks follows over a four-year-period the teacher-student relationship between jazz master Clark Terry and blind piano prodigy Justin Kauflin. It makes its world premiere today at the 13th Annual Tribeca Film Festival. “Keep on Keepin' On" is a love letter, master class and ode to current and future greatness all rolled into one. AH, a former student and band member of CT's, has confessed to knowing nothing about filmmaking when he decided to capture the special relationship between an old lion and a young club. Well done. Other films/events on today's TFF2014 schedule: “5 to 7,” “Gabriel,” “Life Partners,” “Super Duper Alice Cooper,” “Point and Shoot,” “Regarding Susan Sontag” and “Ballet 422” (see video at right).